King Prithu is one of sixteen exalted kings referred in Hinduism. His stories are found in the Puranas and his greatness is mentioned in the Drona Parva (69) and Shanti Parva (29.132) in the Mahabharata. The story of Prithu milking the earth for the welfare of all living beings is found in the Vedas, Puranas and Epics. As per Satapatha Brahmana, Prithu was the first crowned king on Earth, after whom the Earth has gone by the name Prithvi. It is for this reason that the ritual forming the part o the ceremony of crowning of a king is called partha homa (oblation of Prithu). King Prithu, was the son of Vena, and is believed to be the one who commenced the system of kingship. This detail is found in Satapatha Brahmana (5.4), Taittiriya Brahmana (2.7.5.1), Bhumi Khanda of Padma Purana (28.21) and Katha Samhita (37.4). As he started the system of kingship he is referred to as Adiraja (first king), Prathama-nrpa, Rajendra, Rajaraja, Chakravarti, Vidhata and Prajapati. As he is the son of Vena, he is also known as Vainya. 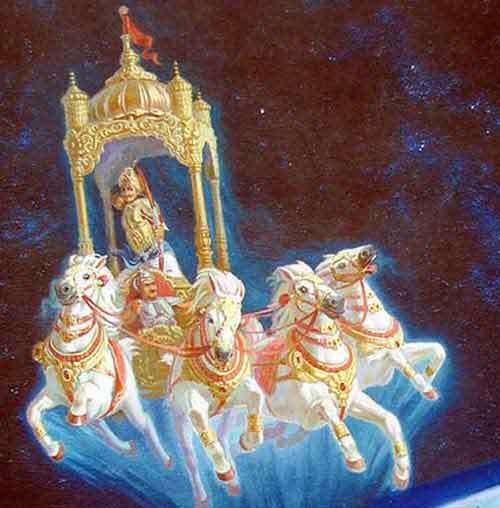 As per Vishnu Purana (1.13) and Shanti Parva of Mahabharata (29.132), Prithu treated the Earth as a divine cow or daughter and on this account Earth came to be known as Prithukanya and Prithvi. As per Hinduism, Prithu was the founder of agricultural and urban systems. He helped people to lead a settled life and form communal habitations. He taught people to live as a family to form communities. He founded tribes, villages, towns, cities and forts. He taught people to use natural resources. He taught them farming and the use of plants and grains. He helped them with the knowledge of metals, minerals, precious stones, milk, domestication of animals etc. He taught them arts and stories. He established the system of law and order based on dharma, promulgated the practice of punishment, and protection of the subjects, thus earning the epithets of protector and king who pleased the subjects. (Mahabharata Shanti Parva 59.104-140). As per Atharvaveda (8.28), King Prithu as the representative of the human race, adopted the procedure of agriculture and obtained crops as a result of milking earth. inexhaustible quiver of arrows, a golden crown, a golden throne, a royal staff, an armor, a discus, a sword a chariot, and a conch. As king he performed the famous Ashwamedha Yajna.